The senior senator also echoed a similar theme touted by the crop of Democratic contenders already in the race — including her colleague California Sen. Kamala Harris — to unite the country amid deeply divisive times. 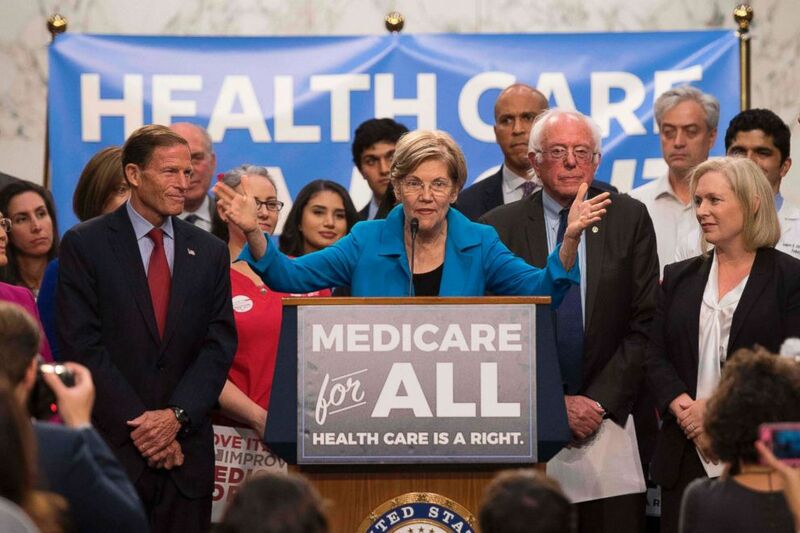 Sen. Elizabeth Warren, center, speaks alongside other members of congress as they discuss Medicare for All legislation on Capitol Hill in Washington, DC. Chants of “enough is enough” and “it’s not fair” frequently broke out throughout the crowd. There were about 3,500 people packed into the quad at Everett Mills, according to campaign staff. Warren chose Lawrence as her launch site to share the history of the city, hearkening back to its early roots nearly a century ago as a haven for immigrants and reminding the audience that it was once a booming center for American industry and reform of labor rules — the Bread and Roses strike catalyzed these changes, which included giving workers weekends. "Elizabeth Warren has already been exposed as a fraud by the Native Americans she impersonated and disrespected to advance her professional career, and the people of Massachusetts she deceived to get elected,” the statement reads. “The American people will reject her dishonest campaign and socialist ideas like the Green New Deal, that will raise taxes, kill jobs and crush America's middle-class. Only under President Trump's leadership will America continue to grow safer, secure and more prosperous." Warren’s announcement comes on the heels of a tumultuous week after new fallout over her claim of Native American ancestry — a claim that, at times, has been a distraction in her political career and a potential impediment on her presidential ambitions. The issue this week arose from a Washington Post report that Warren had identified herself as "American Indian" on a 1986 registration card for the State Bar of Texas. 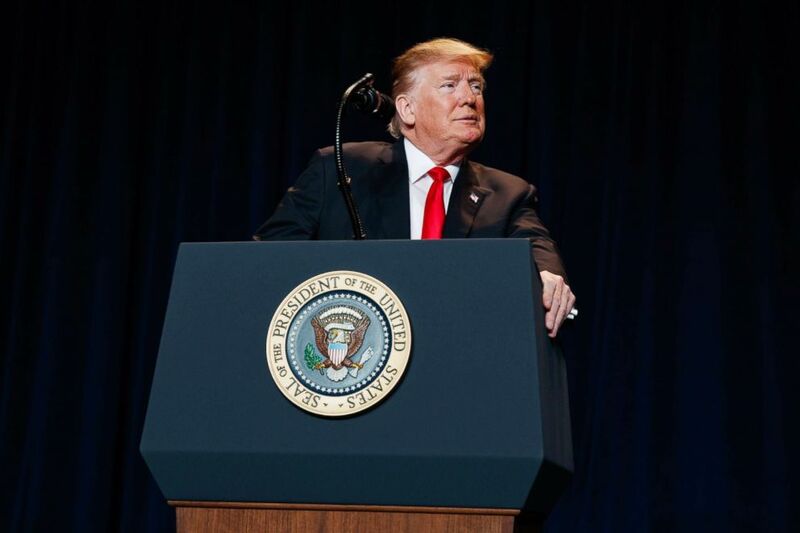 President Donald Trump speaks during the National Prayer Breakfast, Feb. 7, 2019, in Washington. Several attendees, however, dismissed the criticisms against Warren for identifying herself on the registration card. "My understanding is that in her childhood she was told that’s what her background was and I don’t see anything malicious about it," Scott DeVow told ABC News. "It’s a non-event." This most recent stumble in the saga over Warren's Native American heritage seemed to disrupt her momentum heading into Saturday’s announcement and it also raised questions about the durability of her campaign as she continues to confront negative headlines. Following Saturday's announcement, Warren heads to Dover, New Hampshire. As an early primary state — and because of its proximity to Massachusetts and significance as a linchpin in presidential contests — New Hampshire is expected to be key to Warren's campaign. ABC News' Mary Bruce, Adam Kelsey, Mariam Khan, and John Verhovek contributed to this report.